ON 4 February 1789 the electoral college, entrusted by the newly adopted United States Constitution with the election of a president and vice president, voted unanimously for George Washington as the new nation's first chief executive. Since Washington was almost universally regarded as the indispensable man, neither his election nor his acceptance of the post was ever in doubt. It was for this reason that the framers adopted Article II of the Constitution, the section providing for, and broadly stipulating, the duties of the president. There was no problem in granting general and undefined powers to an office that most delegates believed would be filled by a man as universally admired and respected as Washington. When official word of his election reached him on 14 April 1789 (a delay due to the slowness with which Congress assembled), Washington reluctantly and unhappily acquiesced in his countrymen's wishes. "I bade adieu to Mount Vernon, to private life, and to domestic felicity," he confided to his usually matter-of-fact diary, "and with a mind oppressed with more anxious and painful sensations than I have words to express, set out for New York." On the long eight-day trip to New York, then the nation's capital, the president-elect had ample time to reflect on his reservations about satisfactorily filling the office, particularly in view of its predictable problems. Fifty-seven years old, weary of official cares, and in poor health, Washington believed that he had already given too much of his life to public service. Resigned, nevertheless, to rendering the best possible "service to my country in obedience to its call," he realized that a principal contribution would be to diminish promptly the opposition to the new central government that had been revealed in the stormy debates over its ratification, a task that he, more than any other American, was best qualified to accomplish. He was also aware that "the first transactions of a nation, like those of an individual upon his first entrance into life, make the deepest impression, and . . . form the leading traits in its characters." Time has borne him out. The imprint of Washington's two terms in office has been of lasting importance not only in the history of the American presidency but also in the development of a viable national government. Perhaps only he could so successfully have accomplished these goals. Because of temperament, training, and, above all, his prominent status as the architect of American independence, he was the right man, at the right time, in the right job. Of the many biographies written in the nineteenth century, three retain historical interest: John Marshall, The Life of George Washington , 5 vols. (London, 1804–1807), a strongly pro-Federalist account much of whose background material was lifted from the British Annual Register ; Washington Irving, George Washington , 5 vols. (New York, 1855–1859), in which the well-known novelist dramatically and effectively portrayed his nation's foremost hero; and Henry Cabot Lodge, George Washington , 2 vols. (Boston and New York, 1889), which is factually sound but reflects the exalted status Washington continued to enjoy in the late nineteenth century. The twentieth century has produced a long list of Washington biographies. Still interesting, because of its novelty, is W. E. Woodward, George Washington: The Image and the Man (New York, 1926), a muckraking attempt to cut Washington down to human size. The monumental biography of the century and indispensable to scholars is Douglas Southall Freeman, George Washington: A Biography , 7 vols. (New York, 1948–1957), the most ambitious attempt ever made to demonstrate that Washington deserves his exalted position in American history. Richard Harwell edited a one-volume edition of Free-man's work: Washington (New York, 1968). A more recent multivolume study is James Thomas Flexner, George Washington , 4 vols. (Boston, 1965–1972). Flexner provided a one-volume abridgement in Washington: The Indispensable Man (Boston, 1974). The best one-volume biography is Marcus Cunliffe, George Washington: Man and Monument (Boston, 1958). This slender book is a brilliant and fascinating account of the myth and the man, which, Cunliffe explains, "can never be entirely separated." Primary material on the first president abounds. Of principal importance are John C. Fitzpatrick, ed., The Writings of George Washington from the Original Manuscript Sources, 1745–1799 , 39 vols. (Washington, D.C., 1931–1944), and Donald Jackson and Dorothy Twohig, eds., The Diaries of George Washington, 6 vols. (Charlottesville, Va., 1976–1979). Far and away the finest study of Washington's presidency is Stanley M. Elkins and Eric L. McKitrick's encyclopedic and masterful account The Age of Federalism (New York, 1993). Also valuable is John C. Miller's stimulatingly interpretive and uncommonly well written The Federalist Era, 1789–1801 (New York, 1960). A full-scale treatment of Washington's exercise of the executive office is Forrest McDonald, The Presidency of George Washington (Lawrence, Kans., 1974), a study marred by some novel theses that are undocumented or implausible. Particularly commendable are the germane sections of Ralph Ketcham, Presidents Above Party: The First American Presidency , 1789–1829 (Chapel Hill, N.C., 1984). For the administrative history of Washington's presidency, see Leonard D. White, The Federalists: A Study in Administrative History (New York, 1948). An impressive list of books deals with selected aspects of Washington's presidency, in particular the development of the new nation's first political parties. For an example of the traditional account, consult Wilfred E. Binkley's popular work, American Political Parties: Their Natural History (New York, 1943). More plausible and interpretatively original is William N. Chambers, Political Parties in a New Nation: The American Experience, 1776–1809 (New York, 1963). The pertinent sections of Richard Hofstadter, The Idea of a Party System: The Rise of Legitimate Opposition in the United States, 1780–1840 (Berkeley, Calif., 1970), is characteristically excellent. For party ideology, see Joyce Appleby, Capitalism and a New Social Order: The Republican Vision of the 1790s (New York, 1984); Lance Banning, The Jeffersonian Persuasion: Evolution of a Party Ideology (Ithaca, N.Y., 1978); and Drew R. McCoy, The Elusive Republic: Political Economy in Jeffersonian America (Chapel Hill, N.C., 1980). The diplomatic record of the Washington years has been thoroughly explored. Outstanding contributions include Samuel Flagg Bemis's studies Jay's Treaty: A Study in Commerce and Diplomacy (New York, 1923) and Pinckney's Treaty: A Study of America's Advantage from Europe's Distress, 1783–1800 (Baltimore, 1926). The former is significantly revised by Jerald A. Combs, The Jay Treaty: Political Battleground of the Founding Fathers (Berkeley, Calif., 1970). An excellent account of Anglo-American relations is Bradford Perkins, The First Rapprochement: England and the United States, 1795–1805 (Philadelphia, 1955), which argues that underlying the diplomatic squabbles between the United States and Great Britain was a successful and statesmanlike effort on both sides to maintain cordial relations and to settle differences amicably. Franco-American diplomacy has not been as exhaustively explored as Anglo-American relations. Alexander DeConde's Entangling Alliance: Politics and Diplomacy Under George Washington (Durham, N.C., 1958), is comprehensive but marred by the author's sympathy for the Franco-American alliance, which leads to an unnecessarily critical view of President Washington. More objective is Albert H. Bowman, The Struggle for Neutrality: Franco-American Diplomacy During the Federalist Era (Knoxville, Tenn., 1974). The economic history of the 1790s has been comparatively neglected. The most thorough survey may be found in the relevant sections of Curtis P. Nettels, The Emergence of a National Economy, 1775–1815 (New York, 1962). Volumes 1 and 2 of Joseph Dorfman's five-volume study The Economic Mind in American Civilization (New York, 1946–1959) afford an excellent analysis of economic thought. The most invaluable and interpretatively original studies of economic growth, works that integrate traditional economic history and economic theory, are Stuart Bruchey, The Roots of American Economic Growth, 1607–1861 (New York, 1965), and Douglass C. North, The Economic Growth of the United States, 1790–1860 (Englewood Cliffs, N.J., 1961). For books that offer a cultural perspective on the period, see the pertinent parts of Robert H. Wiebe, The Opening of American Society: From the Adoption of the Constitution to the Eve of Disunion (New York, 1984), and Stephen Watts, The Republic Re-born: War and the Making of Liberal America, 1790–1820 (Baltimore, 1987). An annotated bibliographical essay (definitive at the time of its publication) is Jacob E. Cooke, "The Federalist Age: A Reappraisal," in George A. Billias and Gerald N. Grob, eds., American History: Retrospect and Prospect (New York, 1971). Recent works include Richard Brookhiser, Founding Father: Rediscovering George Washington (New York, 1996), William M. S. Rasmussen and Robert S. Tilton, George Washington: The Man Behind the Myths (Charlottesville, Va., 1999), and John Ferling, Setting the World Ablaze: Washington, Adams, Jefferson, and the American Revolution (New York, 2000). This article really helped me in writing my history paper. The information is accurate and it is easy to comprehend. Thank you so much!! this page has helped me alot on my JROTC paper and I just wanted to show my thanks to who ever this may concern...thanks!! this will help me on my social studdies reprt on him. i diddnt read all of it haha but im guna trry ! WOW!!! There was so much stuff in there that I am sure to have everything for my history project!! 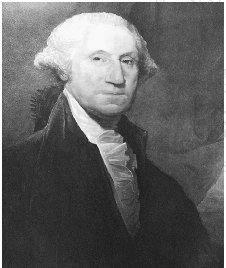 Washington was born on 22 February 1732, the first son of Augustine Washington and his second wife, Mary Ball, in Westmoreland County, Virginia.The only military experience that Washington had preceding the American Revolution was acquired in the 1750s. This article helped me cut off my leftover choices for one of my American History problems. It really helped a lot. Thanks to whoever wrote the article.